When you enter Gardens Presbyterian Church, you’ll often see piles of donated items filling the church office area. Many of the items are new and used household goods, clothing, toys, school supplies, groceries and big box items from COSTCO. Once a week, one of our church members volunteers to take these items to the Pat Reeves Village. If the Pat Reeves Village can’t use the items, they are passed along to other local charities in our community. Though they have a wish list, there isn’t much you can send that REACH won’t put to good use. Often residents arrive with only the clothing on their back. Keep in mind the Pat Reeves Village when you shop for non-perishable BOGO food products or when you’re cleaning out your closet. Weekly We accept non-perishable food items and after school snacks for Dorothy’s Pantry at the Pat Reeves Village. Home Goods, Clothing, Bedding, etc… We collect home goods, clothing, bedding items for the families at the Pat Reeves Village. You are welcome to bring your items in anytime during office hours and leave them in the lobby. A special thank you to Hank Spear who takes donated items to the Pat Reeves Village every week. Back to School We collect school supplies and new backpacks for children in elementary, middle and high school over the summer for delivery to the Pat Reeves Village before the start of the school year. Easter The Deacons assemble Easter baskets full of goodies for the children staying at the Pat Reeves Village. Thanksgiving Thanksgiving Dinners are prepared and delivered to the families residing at the Pat Reeves Village. If you would like to make a donation for this event, kindly indicate REACH Thanksgiving in the memo section of your check. Christmas We collect and deliver donated gifts for the children at the Pat Reeves Village for Christmas. The church’s Christmas tree has tags on it with a child’s name, gender and age that you can shop for. Gardens Presbyterian Church has a long history with Program REACH at Pat Reeves Village. Pat Reeves Village is a member of a collaborative of service providers representing a continuum of care for the homeless and homeless at-risk in Palm Beach County. Pat Reeves Village is an emergency shelter for homeless families with dependent children and is staffed 24 hours a day, 7 days a week. Families in the shelter are part of a structured, supportive program that includes crisis counseling provided by The Center. Residents with other needs are linked with collaborative agencies, after-school tutoring by Palm Beach County School District teachers is provided to children at the shelter, and families receive budgeting and employment counseling. Pat Reeves Village provides temporary emergency shelter in area motels for homeless families. For people at imminent risk of homelessness, this program provides food vouchers, assistance with rent, mortgage and utilities. They also provide relocation assistance (Traveler’s Aid) for individuals who are stranded to return to their out-of-town families. Referrals, food, clothing and personal hygiene items are provided to the homeless and at-risk served by both programs. 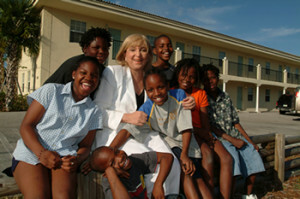 For more information on Program REACH at Pat Reeves Village, call 561-514-0564.